We are a nonprofit organization providing home, health and hospice care to people of all ages. Our mission is to promote the optimum level of well-being, independence and dignity of those living in the community by providing trusted, compassionate and expert health care. Providing in-home nursing, licensed nursing assistants, medical social workers, rehabilitation & other specialized services. Providing relief and comfort from the pain and anxiety associated with a serious illness. 24/7 Private Duty offers many services to help you or a loved one age in place. Providing health and wellness services including community clinics and educational programs. Providing physical, emotional and spiritual support for those who are experiencing a life-limiting illness. Join our 'Circle of Caring' volunteer program by becoming a companion, senior companion, hospice, pet therapy or office volunteer. Cornerstone VNA has received many local and national accolades in recognition of positively impacting the lives of families through their compassionate, high-quality care. 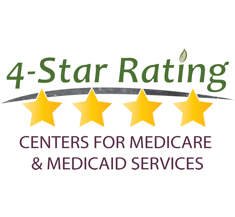 Cornerstone VNA received a 4-Star Rating for performing better than other agencies on the 9 measured care practices and outcomes. 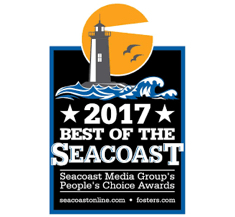 Cornerstone VNA was chosen as Best Home Health Care for the 2017 Best of the Seacoast People’s Choice Awards. 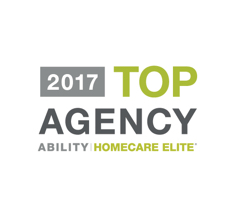 Cornerstone VNA has been named a Top Agency of the 2017 HomeCare Elite®, a recognition of the top-performing home health agencies in the United States. 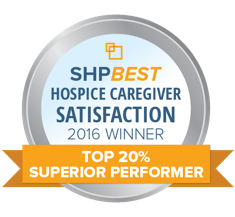 Received for providing superior performance in Hospice Caregiver Satisfaction and reflects a top 20% overall score. 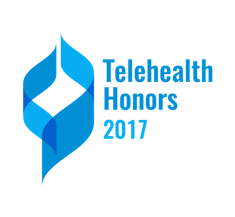 Anne Carle, RN, Clinical Coordinator at Cornerstone VNA was awarded the 2017 Telehealth Honor® Award for providing exceptional patient care in the home using modern telehealth technology. 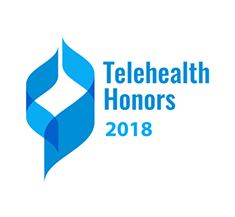 Anne Carle, RN, Clinical Coordinator at Cornerstone VNA was awarded the 2018 Telehealth Honor® Award for providing exceptional patient care in the home using modern telehealth technology. 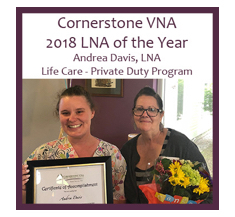 Andrea Davis, LNA was named Cornerstone VNA LNA of the Year for bringing a warm & calming presence to her patients. 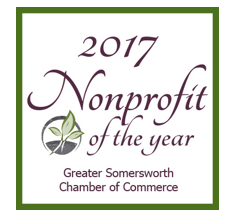 Cornerstone VNA was presented with the Nonprofit of the Year Award by the Greater Somersworth Chamber of Commerce. 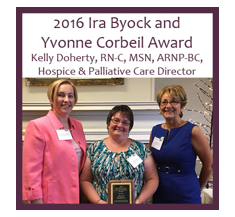 Kelly Doherty, Hospice & Palliative Care Director, received the award for demonstrating innovation & collaboration to improve quality, expand access, & increase efficiency in delivering end-of-life care. 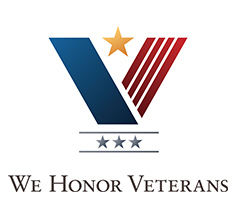 Cornerstone VNA has achieved level three status with the “We Honor Veterans” program., reflecting our commitment to ensuring veterans have access to quality end-of-life care. 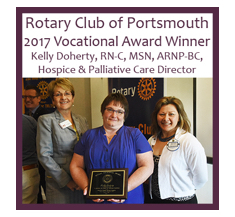 Kelly Doherty, RN-C, MSN, ARNP-BC, Hospice and Palliative Care Director, received the 2017 Vocational Award from the Rotary Club of Portsmouth. Cornerstone VNA received the first ever Nonprofit of the Year award by the Greater Rochester Chamber of Commerce for making a sustainable impact in the Rochester community. The Alliance is a nonprofit membership organization that enhances the ability of home care agencies to provide the best care possible to NH residents. 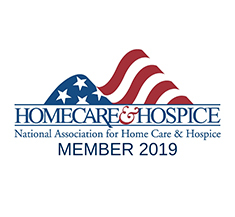 NAHC is a nonprofit that represents home care and hospice organizations. NAHC provides advocacy and information to help its members maintain the highest quality of care. Cornerstone VNA took the regional lead in developing a community palliative care program. Once again, their leaders, team and board took an initiative to fill a new dimension in health care. It’s my pleasure to speak out in their support and underwrite their programs. There are no words to truly highlight the genuine care, compassion, tenderness and love these selfless caregivers gave my mother in her final months and days. If you can, you will never regret giving your loved one the “GIFT” of Cornerstone VNA! Many thanks for all the love and support each of you gave my friend. You made her days and nights happy and she loved you all. I also want to express my deep appreciation and thank you for the support you gave me. I admire you all for what you do so well. Thank you. 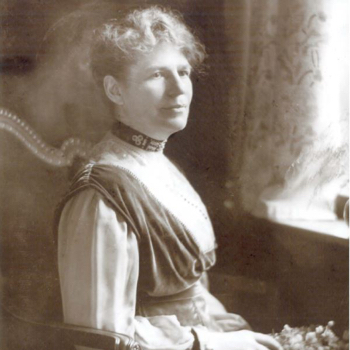 In 1913, Norma Snow made her dream of caring for others a reality with the establishment of the VNA, with support from the Rochester Women’s Club and the Ladies Aide of the First Church Congregational.